I think that the ability to model mathematics happens when students truly understand what is happening in the context AND they understand what an equation actually does. For me, if students are having trouble modeling, especially if they are really trying, I realize that there are probably some additional, missing understandings. I then look for and seek to address the missing components. One of the important ideas/activities in my classroom this year will begin with a context, continue with student struggle and conversation, then modeling the situation. The “math” comes next. I like your reminder to bring the math back into the context, because sometimes, once the answer is found, it’s just a number, without any context. I just read the two print link articles. Modelling is what engineers and others do ALL the time. Then it’s out with Matlab, Simulink, Finite Element stuff, Mathematica to do the “sums”. It does look to me as though the CCSS modelling is treated as “bigger, better word problems”. Not really surprising, as many teachers of math have never created a mathematical model for anything. I like the basketball example, but one day a student is going to ask “Why does the parabola thing do the job?”. This should lead into Newtonian mechanics, which is sorely missing in K-12 math. Modelling with math really ought to include consideration of problems where the model is easy enough to formulate, but the analysis is not simple. This will definitely fit in with your aspirin/headache thinking. Interestingly, when I got involved with control systems and the resulting differential equations it was a big surprise to me that no-one in that field ever SOLVED a differential equation, but did know how to put one together, and to interpret behaviour from its structure. As best as I know, it was H.O. Pollak who began the study of mathematical modeling (still under the name of ‘applied mathematics’ or ‘mathematization’ at the time) within mathematics education. As reminded by the second link: I recall an instance in which both of you mused on the phenomenon that is the ‘express lane’ in a grocery store. Here is an image syncing up brief excerpts from the two pieces (blue to indicate an important observation about the ‘y-intercept’; purple to indicate a shared joy in using supermarkets to situate modeling problems). I believe that this is the best example of public mathematical modelling that I’ve ever seen. It has a lot of nice features that make it easy to share with students (and non-students for that matter). It is also done by someone who does quant work for a living, so it gives you a nice peek into how someone in that field thinks about modeling and problem solving. I only watched about the first 15 minutes of your “fake world maths” Talk, but that was all I needed to set me on my way. I found a textbook problem that guided students through a procedural exercise using index laws and scientific notation to explore exponential growth in the context of population density around the world. The problem required many, many calculations, and all the questions were already in place. Your talk convinced me to flip it. Present some of the data, then have students generate the questions…..students responded, a bit slowly at first, then one quiet students said “I have a question, but it is really a political one, so I don’t think it counts”…her question was ” why are we refusing to accept more refugees into our country when our population density is so small compared to other countries? and then, the floodgates opened….students began to see how exploring the maths to ask questions and make predictions could change the way they think about everything! I teach in an all girls school, and I think I might have just motivated a few to further their interests in Mathematics. I’m convinced! And it was very, very easy to implement. Thanks for the editing, Maya. Love Pollak’s work. That one is great. 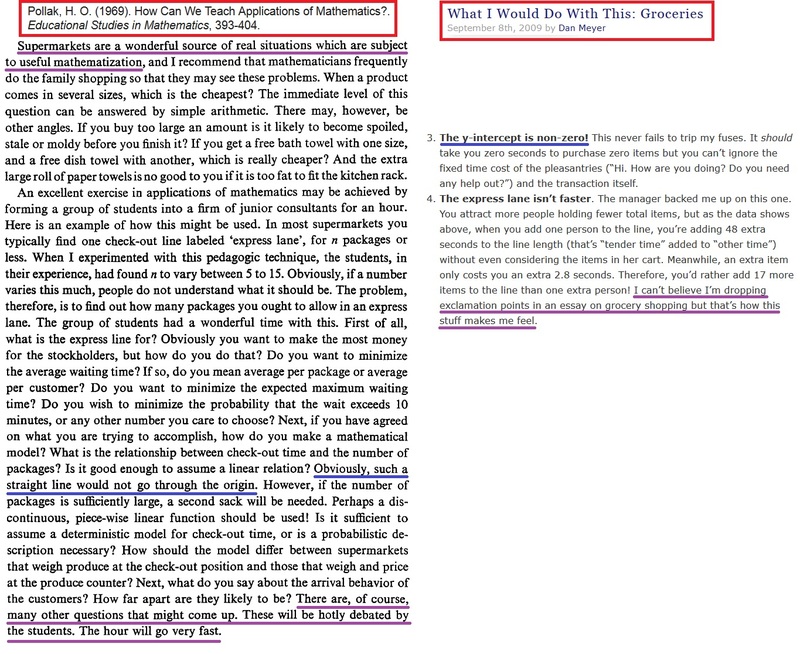 My question is always this: how do I make the work of professional modelers tractable for the novices we teach? I know I could stand from the front and share details of the taxi analysis. But that’s primarily expository when I’d like to be a bit more interrogatory, bringing students into the work through some helpful questions. Excited to see what questions you tackle next! What class of models students “use” in regular days? Afine models are the majority. Can we provide situations when this fails and students “should” (are forced to) model with other functions? Interesting article on the model behind the chilly office space in the New York Times this week.